As I’m sitting in a cafe brainstorming ideas on health and fitness topics to write about, I overhear a man talking about his dad’s poor health. Apparently since retiring last year he’s done nothing but sit around and as a result has gained significant weight. All out of ideas and in a desperate attempt to lose weight quickly he’s contemplating doing an extreme diet. It’s a toss-up between a meal replacement detox (brand to remain anonymous) and a protein only diet. This is bad for so many reasons which I won’t get into. Instead, I will use it as a metaphor for modern society and to highlight our unhealthy obsession with quick fixes to long-term problems. Admittedly, I’m guilty of feeling a sense of urgency when it comes to certain aspects of life. Online purchases being delivered, immigration issues and winning the lottery spring to mind. I do not however feel the need to go to extreme measures when it comes to my health and fitness goals. Perhaps it’s because of my experience or the fact that I know, if it sounds too good to be true, it probably is. For me, fitness forms part of a healthy lifestyle, not a commodity that you can simply pick off the shelf or have UPS deliver to your front door. As a personal trainer I’ve heard all sorts of fitness goals and aspirations. None of which surprise me. In fact very few of which are unattainable. What does surprise me is how misled people often seem to be when it comes to the time frame or the necessary steps required to achieve their goals. The truth is, I can’t blame people for wanting to lose 21lbs in 21 days or to sculpt a 6 pack in 7 minutes or less. After all, It sells and it’s important to dream. However, if you’ve spent years sitting on the sofa eating chocolate pudding, you’d be crazy to think you’d be able to reverse the effects of poor lifestyle choices in a matter of days, weeks or even months. Now, this isn’t to say that you can’t get fit as a fiddle, lose 21lbs or get action-hero 6-pack abs. All of these things are 100% achievable, just not overnight. Allow me to use another metaphor to emphasise my point. Remember the story of the tortoise and the hare? The hare who bragged endlessly about his immense speed. The tortoise tired of hearing him boast, challenges the Hare to a race. The hare gets off to a flying start, gets cocky then distracted, stops and falls asleep. 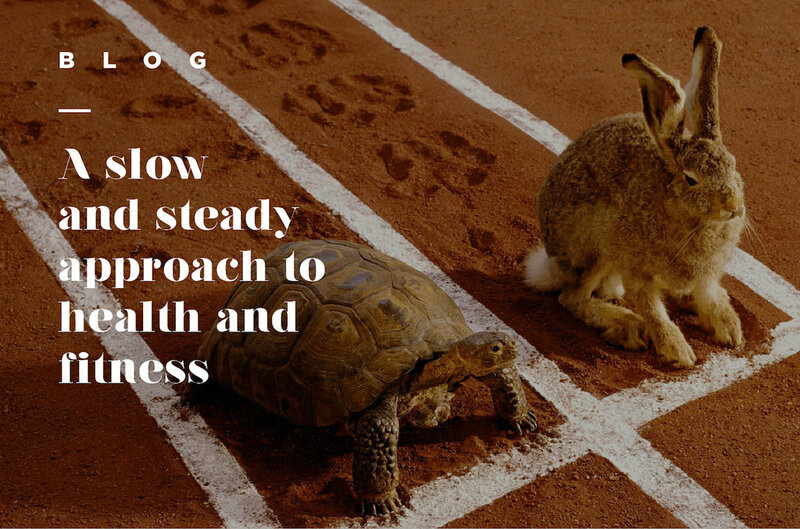 The tortoise meanwhile starts slowly but keeps constant pace until he reaches the finish line to win the race. Perhaps this isn’t the best metaphor as there is no finish line when it comes to a healthy lifestyle. But consider this, the tortoise and the hare had the same goal. It’s an achievable one yet the success is dependant on the manner in which one chooses to get there. One of the fastest ways to fail is to believe that you can cut corners or take extreme measures to fast track your results. Health and fitness marketing is very clever. Billions are spent every year exploiting the insecurities we all have within ourselves and commercially it seems to be working. From the cabbage soup diet and clean program to the actual infecting yourself with a tapeworm in a desperate attempt to lose weight. If you ask me, it sounds like torture - you can only survive so much of it before you give in, run out of money or die (whichever comes first). The big problem with most extreme measures is they’re in no way sustainable. Sure, they might result in dramatic short-term results, but you will eventually lose enthusiasm, feel overwhelmed, burn out or simply give up as the intensity is impossible for most people to sustain for more than a few weeks at a time. Instead, try to change your mindset and think long term. If you’re wanting to get a body you can feel proud of for your summer holidays for example, start now. Not only will the workout and diet program be far less traumatic, the results will be far better than if you start 3 weeks prior to your holidays. Moreover, you’ll develop healthy habits that you can sustain long after your summer holidays are over. If you feel that an extreme workout or diet plan is the only solution to your problems, ask yourself, what’s the rush? Your goals, regardless of how big or small are achievable but not always as quickly as you might want. By making small but significant changes to your lifestyle, diet and exercise plan (ones that you can sustain) you stand a far greater chance of achieving your goals. Remember, progress is never linear and you’ll undoubtedly have a hiccup or two along the way. However, if you can be patient and stick with it you can rest assured that there’s very little you can’t achieve!